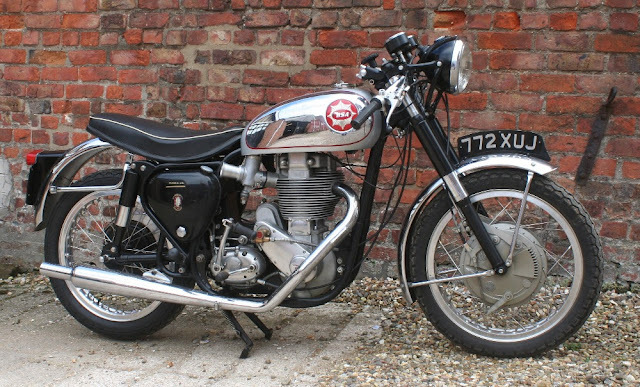 In a hit parade of the best classic bikes, the BSA Gold Star would shoot in with a bullet! And of the plethora of two-wheeled products from the 'Birmingham Small Arms' company, few could match the 'Gold Star' in calibre and charisma. Dubbed the 'Goldie', the bike attracts awe and affection, in equal measure. Its name is a tribute to Walter Handley's 100mph lap of the UK's legendary banked oval. He was given a Brooklands 'Gold Star', for his trouble. The Goldie is great to look at! Race-style, clip-on handlebars crouch over a chrome tank - emblazoned with the famous Gold Star badge. Below, focus flows from a gaping Amal carburettor - through the finned block - to a stylish swept-back pipe. Such visual extravagance was echoed technically ... the Gold Star had a straight-line speed of 110mph. Competitively, the Gold Star was versatile, to say the least! It shone in road racing - and in motocross and trials, too. It was in 1956 that the Goldie made its stellar début - at the Isle of Man Clubmans TT. The bike was a café racer dream come true! Fast-forward a few decades - and there is many a classic bike fan still dreaming!